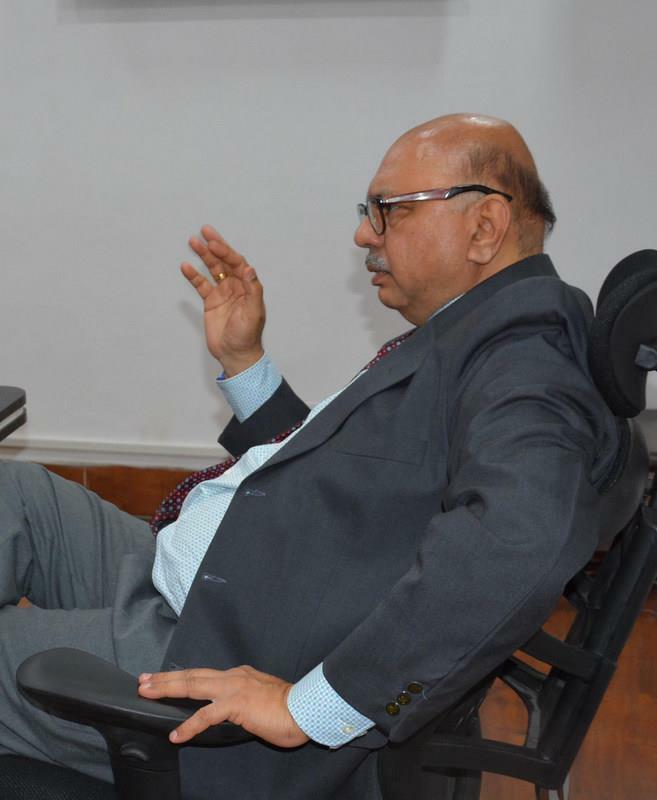 JAMMU: Advisor to Governor, K Skandan today called for evolving an effective mechanism to facilitate growth of Animal, Sheep Husbandry, Fisheries sectors and raising the income of farmers associated with this mode of framing. He further stressed on the need for formulation of a progressive livestock breeding policy. The Advisor was speaking here at a meeting he chaired to review the achievements registered in the state under Animal, Sheep Husbandry, Fisheries sectors besides departmental activities. Principal Secretary, Animal, Sheep Husbandry, Fisheries and Transport Department, Dr. Asgar Hassan Samoon, Director, Animal Husbandry Jammu, Dr. Victor Koul, Director, Animal Husbandry, Kashmir, Dr Mohammad Yusuf Chaproo, Director, Fisheries, R N. Pandita, Director, Sheep Husbandry, Jammu, Dr Sanjeev Kumar, Joint Director, Sheep Husbandry, Kashmir, H S Rana and other officers of concerned departments and Technical officers attended the meeting. Senior functionaries of NABARD (National Bank For Agriculture and Rural Development) including CGM, NABARD, Suresh Chand, DGM, NABARD, K M Bijutkar and Manager, NABARD, G K Bhattacharjee also attended the meeting. The Advisor asked the NABARD functionaries to rope in a consultant to study the human resource potential for livestock, fishery natural wealth and capacities of the farmers of the state so that requisite measures are taken to support the farmers and creating linkage of the markets for their produce. He further asked them to prepare a proposal aiming towards increasing the income of the farmers in all the allied sectors and providing them with a better livelihood.On establishing the Fodder bank, it was given out that a project has already been sanctioned in this regard. The Advisor said that the livestock is emerging as an important sector and a progressive policy needs to be adopted for the growth and the development of the said sector. Every stakeholder shall be taken on board before adopting the proposed policy, he added. He further directed for computerization of data base of livestock and breeders. The meeting was informed that the Livestock alone contributes 33% of agriculture allied sectors and overall 5.04% to GDP of the state (2017-18). Emphasizing on institutionalizing the livestock vaccination system, the Advisor enquired about the registration of livestock breeders, training of breeders, category wise migratory livestock, vaccination of livestock, linkage of sheep breeders with vaccination centers, maintenance of records, issuance of cards, migrant livestock vaccination and registration. While reviewing the Fisheries sector, the Advisor was informed that the Trout production of the state is the largest in the country and has tremendous growth potential. The Advisor opined that there shall also be a policy for Fishery sector and consultants with expertise shall be engaged for analyzing all the aspects of the said sector. The meeting also discussed about creation of infrastructure for wool processing, preparation of data base report, research, strengthening of veterinary colleges, poultry insurance, establishment of more farms, optimal utilization of human resource, monitoring, annual productivity of milk and Cooperate tie-ups.